There's a relatively new technology built in to most browsers that could revolutionize the way you talk with your friends and family. Called webRTC, the HTML 5-based tech could one day replace the need for third-party plugins from services like Google Hangouts or Skype, offering voice and video chat capabilities natively in your browser. Even better, most implementations of the technology don't require an account of any kind. Chats take place on a web page that you set up on a site that supports webRTC. To get chatting all you have to do is share a link to the web page and you'll be up and running in no time. Talk about hassle free! If you'd like to give webRTC a try, here's how to get started. Many current browsers for the PC support webRTC, including Chrome, Firefox, and Opera. Apple's Safari doesn't and neither does Microsoft's Internet Explorer; however, Microsoft-owned Skype plans on supporting webRTC in the future with its newly announced Skype for Web project. If you want to go mobile Chrome, Firefox, and Opera support webRTC on Android. On iOS you can try Bowser. Once you've got your browser picked out it's time to start using webRTC. Sites that support webRTC include appear.in, talky.io, and apprtc from webRTC.org. Most of the sites that support webRTC are incredibly easy to use and don't require a lot of technical prowess. For our purposes I'll just show you one example and leave it to you to apply that knowledge to another service. Talky.io is one of several web sites that support webRTC chats. Let's use Talky as an example. On the Talky landing page, you have to enter a name for your conversation. It can be pretty much anything you want so let's call it "no hassle example." Next, you press the pink Let's go! button and you'll be taken to a conversation web page. A settings warning should appear on your browser asking for permission to access your webcam and microphone. Now all you have to do is share the link to the web page you're on, wait for others to join, and you're ready to go. Mozilla is testing a built-in webRTC chat button for Firefox. If you're running the test version of Firefox there's a slightly easier method to get chatting. The latest beta versions of Firefox come with a new chat button with webRTC, supported by Telefonica--one of Mozilla's partners for Firefox OS. 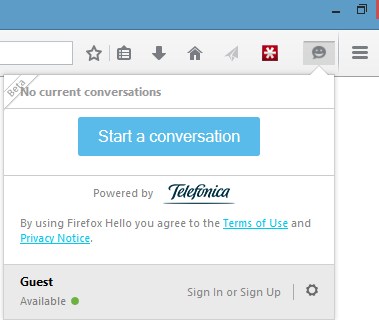 In the case of Firefox, after you click the chat button, click the Start a conversation link. A pop-up window will appear in the bottom of Firefox asking you to name the conversation and then giving you the opportunity to email or copy the link to the chat's web page. Just to be clear, it doesn't matter if you use Firefox and your chat buddies use Chrome or Opera. As long as everyone is using a browser that supports webRTC there shouldn't be any compatibility problems. That's about all there is to webRTC. In my experience, the call quality isn't quite as good as you'll experience on Hangouts or Skype, but it'll get there eventually. In the meantime, happy chatting.